18.1.1915: Registered at Hull (H223) (Hugh G. Chapman, manager). By 11.8.1917: Fitted 1-6pdr LA. 1919: Released (Hugh G. Chapman, manager). 1923: Owners restyled Eastern Fishing Co (1923) Ltd, Hull (Hugh G. Chapman, manager). 12.6.1940: Requisitioned for war service as an auxiliary patrol vessel (Hire rate £62.8.6d/month). 12.11.1941: In company with FRANCOLIN (Sk. Lieut. J. L. Dinwoodie RNR) which subsequently foundered after German bomb attack, shot down Dornier 17 (Chief Sk. A. S. V. Jones RNR). 3.1942: Fitted out as a minesweeper (P.No.FY.111). 1945: Reclassed at South Shields and returned to owner. 1947: Sold to Odafoam Ltd, Liverpool (William Stevenson, St. Anne’s-on-the-Sea, manager). 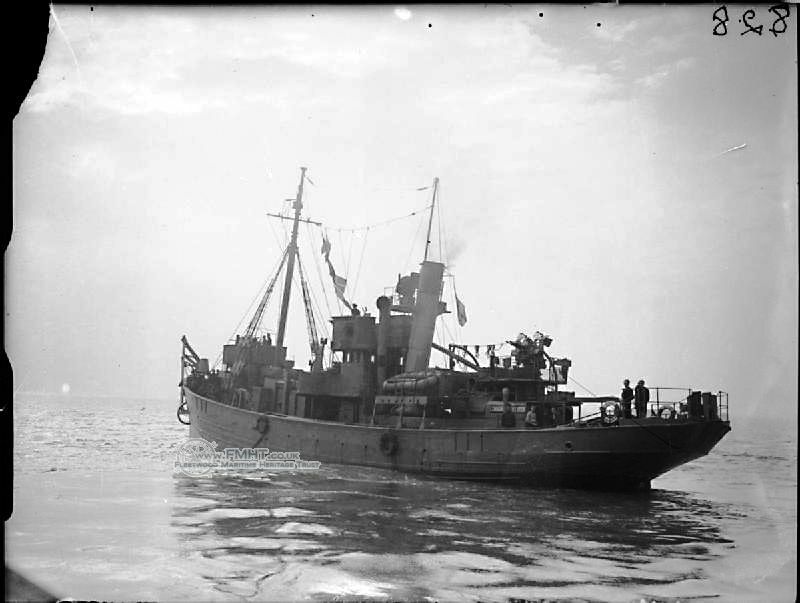 27.9.1949: One of five trawlers aground in the Wyre Channel in thick fog when outward for the fishing grounds. Refloated next tide and proceeded. 3.1950: Sold to Alexander Hay, Aberdeen. Registered at Aberdeen as EPHRATAH (A659). 1960: Sold to BISCO (£2610) and allocated to Shipbreaking Industries Ltd for breaking up at Charlestown, Fife (Contract No.90E). 22.11.1960: Delivered Charlestown from Aberdeen under own power. 20/05/2012: Page published. 7 updates since then. This entry was posted in Steam Trawlers, Steamers (Picture) and tagged No Fleetwood owners on May 20, 2012 by Fred Smith.